With great power comes great responsibility. Whether you are Spiderman or a power pitcher or a power hitter or a general manager who has the power of the pen, there is a great responsibility to the fans to put a competitive team on the field. 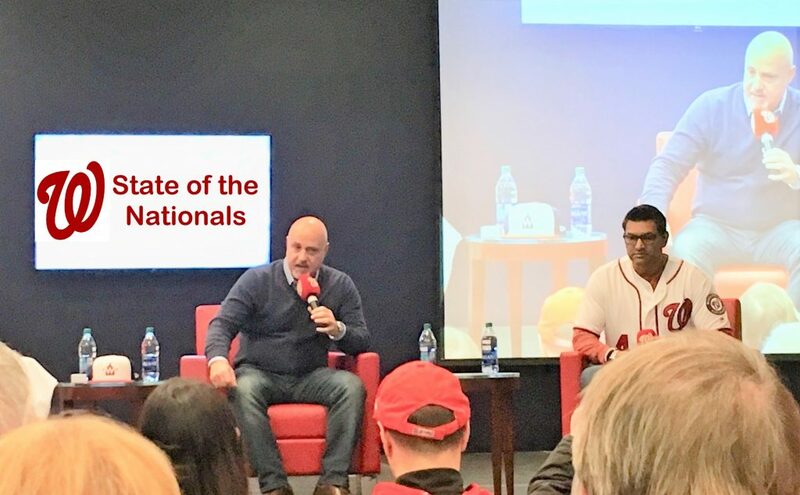 The Washington Nationals are in “win mode” once again and have spent the money on payroll to improve their roster going into Spring Training. The mild-mannered Buster Posey went public with an unsolicited response to Philadelphia’s manager Gabe Kapler who said his team is in win-now-mode and pushing their chips into the middle. The Posey rant rings timely to the current state of baseball with teams that are tanking while also pocketing large amounts of profit in many cases. An example of a team currently in tank-mode while pocketing huge profits is the Texas Rangers who according to Forbes had an operating profit of $80 million, and this off-season so far the Rangers have reduced their payroll by $34 million from last season. Several teams are spending more money than last year and a few could exceed the CBT threshold of $206 million. There are also several players remaining in free agency like Bryce Harper, Manny Machado, Dallas Keuchel, and Craig Kimbrel. Each of those players will skew the final salary numbers. This week, the Nats completed their final arbitration eligible contract with a successful outcome against Kyle Barraclough at $1.725 million for 2019. 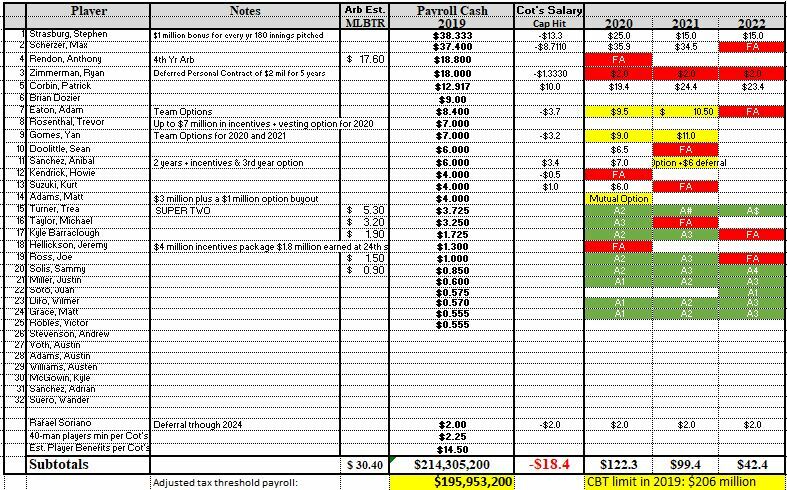 The Nationals are now at $196 million in committed payroll using the CBT formula. On the surface that would suggest the Nats are $10 million below the cap, but in reality they have some very large incentives ($14 million) that could be earned. Those incentives could push the Nationals over the limit. The operative word is “could” because there are situations that an actuary would use to create a probability for each player. The three players with incentives are Trevor Rosenthal ($8 million), Anibal Sanchez ($2 million), and Jeremy Hellickson ($4 million). Here is how Trevor Rosenthal’s incentives package is calculated as he can earn $500,000 each for 25, 30, 35 and 40 games pitched next year, $1 million apiece for 45 and 50, $1 million each for 20, 30 and 40 games finished, and $2 million apiece for 50 and 60 with a maximum of $8 million. There is an $8 million maximum. He could also earn a $1 million assignment bonus if he is traded. On top of that he has award bonuses for reliever of the year and Cy Young. Consider for Rosenthal that he has pitched in at least 50-games a season in every year except for his call-up season and 2016 when he pitched in 45-games. Based on Rosenthal’s history, count on at least 50 games played which would pay him a $4 million bonus. If all goes well with Sean Doolittle‘s health in 2019, Rosenthal should not get many save opportunities. For Anibal Sanchez, his incentives package is more straightforward as he will earn $500,000 each for appearing in 18 games, 22 games, 26 games, and 30 games. Sanchez will hopefully reach the 26 games mark in 2019, but he has only pitched 30 games in a season one time since 2012. At 26 games, Sanchez would earn $1.5 million. In Jeremy Hellickson’s deal which was ratified this week, he has incentives for games played at $200,000 per milestone at 3/5/7/9/11/12/14/16/18/21/23 games played and above that at $300,000 per milestone at 25/26/27/28/29/30 games played for a maximum total of $4 million. If Hellickson starts 30 games, he will max-out his earnings at $5.3 million. Hellickson has averaged 28 games per season in his career. That would guarantee him incentives of $3.4 million for 2019. Add up all of those “probable” incentives, and the Nats would be at $8.9 million earned for a total of almost $205 million. As always, a few of the Nats players have awards bonuses in their contract. All of that once again leaves Mike Rizzo with little margin for error in the goal of staying under the CBT similar to 2017 when the team went over the threshold by a small margin when awards bonuses tipped the scales. Rizzo could give the team a larger buffer if they traded a player like Michael Taylor who will earn $3.2 million or cut him by March 15th where the team would have to eat $533,333. Another alternative is extending Ryan Zimmerman while including his 2019 deal and creating a new contract at a lower AAV which could potentially save $5 million to $7.7 million in 2019. If the Nationals exceed the $206 million competitive balance tax for the third consecutive year, the penalty would increase to 50% on the overage. Keep in mind that first time offenders pay a penalty of 20% while second time offenders like the Nationals in 2018 paid a 30% penalty on their payroll overage. Not only is there monetary penalties, but there are also penalties in draft order which could affect the Nationals this year if Bryce Harper signs with another team. The harshest penalties hit teams who go over the cap by $20 to $40 million plus. The Red Sox met the fate of the latter penalty and will lose 10 slots in the 1st round draft this year. But don’t cry for the Red Sox, they have the revenue to eat the penalties, and they have World Series rings to ease the pain on the draft penalty. This entry was posted in Feature, MikeRizzo. Bookmark the permalink.